Yosvani Ramos thought his Achilles injury would be the end of his career. But in fact, it may keep him dancing even longer. Yosvani Ramos performs for the Colorado Ballet prior to his Achilles injury. Photo courtesy of Yosvani Ramos. The second Yosvani Ramos hit the ground, he knew something horrible had happened. He could see his heel bone, but not the tendon. Ramos has been in love with ballet since he was young and started performing as a youth. He won the gold medal at the Paris International Ballet Competition in 1998, and then went on to be a principal dancer for the English National Ballet, The Australian Ballet and the Cincinnati Ballet before joining the Colorado Ballet in 2015. But at only 37, he lay on the ground during a “Nutcracker” rehearsal, thinking it was the end. Six days after his injury, Dr. Joshua Metzl performed a minimally invasive procedure to fix Ramos’ Achilles injury — a technique proven to decrease surgical risk and allow for quicker recovery. Metzl serves as the head orthopedic physician for the Colorado Ballet, as well as the assistant team physician for the Denver Broncos and Colorado Rockies. And that’s when Ramos realized it wasn’t the end. UCHealth Steadman Hawkins Clinic-Denver has a marker-less motion analysis known as Dynamic Athletics Research Institute. It’s essentially an avatar — a system that tracks the patient’s every joint — and by taking them through a battery of tests, evaluates their range of motion and strengths. This allows for a specifically tailored rehab program to bring the patient back to where they want to be. Ramos started small, with little stuff. He was going to rehab at Steadman Hawkins twice a week for one hour and then committed to doing those same exercises at home or in the gym during the rest of the week. As he improved, he started pushing himself more and would exercise for two hours with a day of rest in between. Ramos started rehearsing for Colorado Ballet’s “Dracula” in early September 2017 — less than a year after his Achilles injury — and he returned to the stage a month later for its opening. 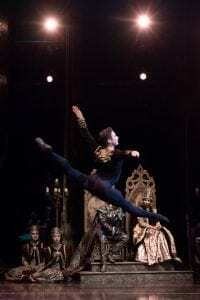 Ramos continued the season, performing in the “Nutcracker” in December, then on to play the part of Romeo in “Romeo and Juliet” and has been preparing to be the prince in Colorado Ballet’s production of “Sleeping Beauty,” which opens this month. He had returned with a whole new understanding and knowledge of his body, he said. “I’m still lucky that I’m performing at the top of my game,” he said. But when the time does come, he said he’ll put what he’s learned toward directing.